I recently became aware of a US based Intelligence and Behaviour Expert by the name of Chase Hughes. I picked up his book The Ellipsis Manual which has been a great addition to my collection of books and resources on body language and human behaviour, I suggest picking up a copy if this sort of thing is of interest to you also. The aim of this table isn’t that you learn and memorise it and become a body language guru, I mean if you can do that and become some savant in weeks or months then perhaps you can sell and profit from that technique that takes others years to master :). Instead, consider this a reference manual of sorts. During your observational analysis of individuals you can take notes on their behaviours, posture, body movements, etc to establish the base line behaviours. You can then reference these observations to the behavioural table of elements to attempt to decode some of these behaviours to make a more informed analysis of individuals. This table is available as both a high res download as well as a spreadsheet from Chase Hughes website. The spreadsheet makes things even easier to understand, as you can hover over a cell and it provides a more descriptive overview of the behaviour. 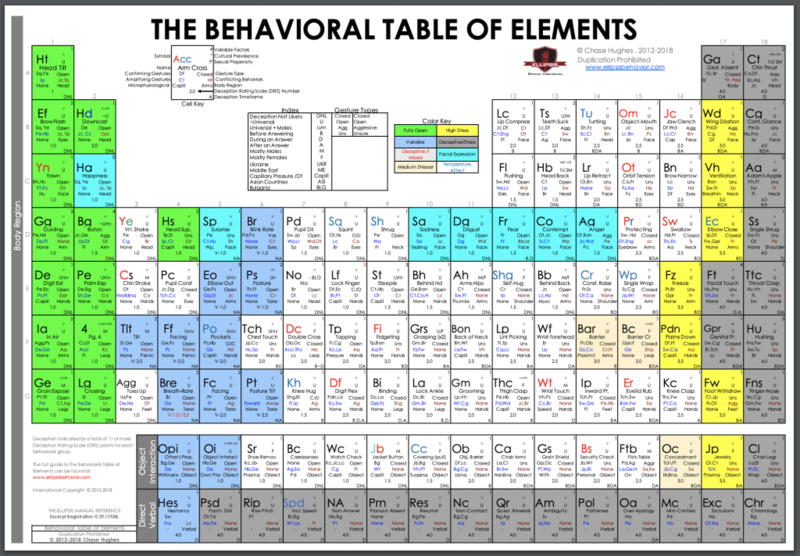 At first glance the behavioural elements table can seem as confusing and oddly laid out as the original periodic table, but once you understand how it flows it actually makes alot of sense. It might not look like it, but it actually follows the shape of the human body, from head to toe. 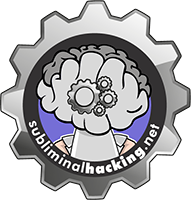 Chase has documented how to use the table on his site, but for completeness I will duplicate here to get you jumped started, but be sure to go download the Behavioural Elements Table and continue your learning journey. Each cell provides various factors related to the behaviour, along with conflicting actions (remember a baseline is important). The cell information can be used in isolation, or in combination with other observations for a more complete analysis. Colour coding of the cell information provides a more rapid suggestion of the behavioural category being observed. Green being most relaxed, and red most stressed. This is what Chase calls the Stress Continuum. Stress levels increase on the chart from left to right, and this also tends to increase levels of deception also. Vertical reading. As mentioned previously it follows the human body, head at the top and toes at the bottom. You will notice in the lower right of each cell a few letters. This information relates to the Deception Time Frame Indicators. Outer Body Elements. You will notice on the chart a little section at the bottom on its own. These are things that exist outside of the body. These consider the interaction and verbal activities. Adding it all up. You can use this chart to generate the Deception Rating using Chases framework. This utilises all the information mentioned above, including temperate, temperament, etc to reach a final score on the BDA Framework. This can all seem abit confusing at first glance, so I suggest you download the resources and then spend a few weeks people watching, taking notes and then running your observations through the chart and see how things pan out. Chase also has some other interesting information on his website, so check them out too.